I am so excited about my new recipe! It came out perfect the first time I tried it. The recipe is super easy and quick to make and the biscuits taste astonishingly like the buttermilk biscuits my mother used to make, but these are gluten-free, wheat-free, and low-carb. I used Jennifer Eloff’s Gluten-free Bake Mix™ as a starting point. Isn’t teamwork great? Preheat oven to 425 degrees and line a baking sheet with parchment paper. Lightly grease the paper. Whisk the bake mix, baking powder, and salt together in a large bowl. Add the yogurt, reserving a little until you see if it is needed. Add sweetener and mix with a spatula or wooden spoon until a sticky dough forms. Add remaining yogurt if dough is too dry. Sprinkle your work surface with a little more bake mix. Dip your fingers into the bake mix and divide the dough into 10 to 12 portions. Shape each into a ball and roll to lightly coat with bake mix. Flatten the balls to about 1-inch thick. 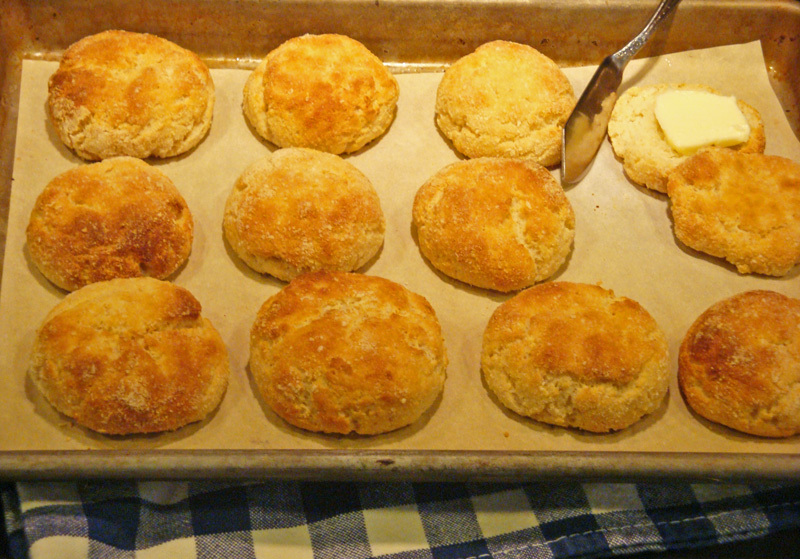 Place the biscuits close together on the prepared pan. Place on middle rack of preheated oven. Bake for 10 to 14 minutes or until golden brown. Remove from pan. Serve hot with butter or use as a base for chicken-a-la-king, as a topping for pot pies or cobblers, with fresh strawberries and whipped cream, or to make ham or bacon and cheese sandwiches. *Nutrition data excludes some of the sugar in the yogurt which has been eaten by the live cultures. TIP: If the bottoms of your biscuits brown before the tops, use convection mode if your oven has that option, or put an extra sheet pan on the bottom rack underneath them to shield them from bottom heat. JENNIFER’S GLUTEN-FREE BAKE MIX™ Used with permission. In a large bowl, combine almond flour, oat flour, coconut flour, and xanthan gum. In container with airtight lid, place bake mix and shake the container well to combine. When measuring oat flour (but not other ingredients) into measuring cup, tap the cup on the counter top and fill to the top to get the correct amount.) Keep bake mix at room temperature for up to one month or freeze for much longer storage. Makes 2 1/2 cups (625 mL). This bake mix is here. There is also a version that uses gelatin instead of xanthan here. Tip from Jennifer: if you don’t want to use any grain at all, you can try substituting another gluten-free flour for the oat flour in the bake mix. Bake Mix, Yogurt Biscuits. Bookmark. I have a question about the sweeteners you mention. I don't know what forms stevia comes in, but because you mention liquid sucralose, I wanted to know if the sweetener needs to be a liquid? I planned o use Swerve in its powdered form. Do you think this will work? Thanks–can't wait to try! They might actually be better with a sweetener with bulk, like Swerve, Just Like Sugar, Sweet Perfection, LC-Sweet, or a stevia / erythtitol combination. I was planning to try it with one of those before I posted the recipe but I ran out of yogurt and decided to go ahead and put it up anyway. After I get to the store, I'll make another batch and add a Post Script if they are better. Let me know if you try Swereve and if so, how it works. Judy – these look amazingly like biscuits! I can't wait to try them. I've used Jennifer's bake mix in her sesame wafer cookies, with a few tweaks from me, and they are awesome. As a matter of fact, any of her recipes with the bake mix are great. I don't know if you know that she has an alternate version of bake mix without the xanthan gum, but uses gelatin instead. Some people can't tolerate the xanthan gum, or simply don't want to use it for whatever reason. I have no issues with it. I might try half a portion of the biscuits, since I don't have that much greek yogurt in the fridge. Question – if you have leftovers, how do you store them? I mentioned the gelatin option, but haven't tried it myself yet. It is good for those who don't want to buy a specialty product as well as anyone who wants to add more gelatin for its health benefits. About storage: I haven't had any that lasted long enough to need it yet, but I think they would be fine in the refrigerator or freezer. They reheat best in a real oven or toaster oven rather than the microwave so they re-crisp. The rise should come from the baking powder. If your baking powder was good, I'd guess it was the lack of fat in the yogurt that was the problem. I live in a tiny town, that is fat phobic, just like everywhere else in America, problem is I can't get full fat greek yogurt. Would regular full fat work, or lower fat (I'm not sure I can even find this) greek yogurt work. I'm not trying to cut fat, but it's been forced on me. What do you think? I think any yogurt made from whole milk would probably work. Greek yogurt is more concentrated, so perhaps you shoud try letting it drain through a coffee filter in the refrigerator first. I alway list exactly what I used because I can't test every option, but I'd like to hear from anyone who tries something different as to whether it works or not. By the way, ask your grocery to stock whole-milk Greek yogurt–if they carry a brand, they can usually get anything that company makes. Let them know what you want! just made these ( 5 min after I read the post!!!!) have tried lots of variations for biscuits and while some were good, none were good enough. These are outstanding!!!! I made them with sour cream thinned with a little heavy cream in place of the yogurt. Next time I'm going to use 1 tsp of baking powder plus 1/2 teaspoon baking SODA. I think they will rise a little better up here in Denver with that combination of leavening. I'm currently eating them with some sugar free lemon curd and faux clotted cream nom nom nom! thanks Judy! Deborah: Thanks, I'm glad you enjoyed them! Thanks also for sharing your experience about using sour cream and heavy cream rather than yogurt. It's good to know an alternative that works. I am eating some of these right now with butter and sugar free strawberry preserves. Ahhhh, yum. Mine did get too brown on the bottom so I'll double the baking sheet next time. What a tangy, biscuity flavor these have! One question: I used unblanched almond flour since that's what I have right now. Do you think it makes a difference? What kind of almond flour do you use? BethMcL: I just made some too! I use blanched almond flour. I think it is better, but it is more expensive. Trader Joe's sells almond meal for about half the price. The recipe might need to be adjusted if you use meal instead of flour, but it might be fine. If anyone tries it, please leave a comment and let us know how it worked. These look amazing, just a quick question if I may please; would a sweetener like aspartame work? Joanne, any sweetener will work. Although we don't think of wheat flour as being sweet, it really is–it is mostly glucose. A little sweetener makes the biscuits taste "normal," but not sweet. I don't use aspartame personally because there are questions about whether it is safe or not. I have tested the recipe with a high intensity sweetener, like EZ-Sweetz, and with a sweetener with bulk, like Sweet Perfection, and they are both fine. Just made these to use for sausage and gravy biscuits and they were AMAZING!!!!!!! Thank you so much for sharing your recipes!!! I have been low carb for the past two years and biscuits were something I missed terribly!!! Thank you again:) Also, I used the sour cream and heavy cream technique since I don't have greek yogurt and I used swerve for the sweetener. That does sound good, Janel! Thanks for letting us know about some other ingredient options. What proportion of heavy cream to sour cream did you use? Hey girl, those are just beautiful!!! Don't you just love Jennifer's GF Mix? I get so jealous sometimes for all of you who can eat almond flour. Your picture makes my mouth just water! Susiet: Are you allergic to almonds? You might try some other low-carb flour, such as pumpkin seed, sunflower seed, garbanzo, or sesame flour. Peanut flour is also an option, as peanuts are legumes, not nuts. Judy, this recipe is best made with almond flour. Almond meal causes the inside of the biscuits to be too moist. Just a heads up on that. I opened my biscuits and baked them longer, but almond flour is the way to go. I liked them a lot. I never thought I could make anything with the Splendid Gluten-Free Bake mix that has no eggs in it…perhaps that's more the fault of almond meal again. Almond flour is really superior. I can get almond flour here, but it is expensive, so I only buy it occasionally. Thanks for experimenting with the bake mix, Judy. I was tickled pink! Thanks, Susie. 🙂 You can't have any nuts? Hazelnut flour also came to mind. Thanks for reporting on your results with almond meal, Jennifer. I always use almond flour for baking as I think it gives a finer texture (and it looks right too). I use my Vitamix to make almond flour from blanched almonds. Much cheaper than pre-ground. You'll find youtube videos on how to do it. To Anonymous: Ah, but how long would it take you to save enough on the almonds to pay for the Vitamix? I've had one on my wish list forever, but I'm still waiting! Hey! I keep this bake mix in my kitchen at all times so am excited to try this recipe. I don't have any yogurt right now–any luck with sour cream? Or any thoughts as to whether you think it would be a similar result? Thanks so much! Hi Amber. Someone tested the biscuits with sour cream and said it worked, but I haven't tried it. Report back about how yours turn out, OK? Janis: sorry about the print button. I'm not very techie and don't make a profit on anything here, so can't do the fancy stuff like the commercial sites. Hey again! I made the biscuits with sour cream and they were quite tasty! Just wanted to report back and let you know! Hi Amber. Thanks for the update! Glad they worked for you. OMG! What a great recipe. I made it with 2 additions and one change. 1st, I used regular whole milk yogurt. Only used a little under a cup because it was so runny, but it worked fine. 2nd, I added a 1/3 cup of cheddar cheese and 1 tsp of chopped fresh thyme. I'm testing recipes for Thanksgiving and this one looks like a winner for "rolls". Can't wait to try it with something sweet and make scones. Thanks for such a wonderful recipe. Hi Wendyloohoo. I like your variation! Let us know what else you try. My pumpkin biscuits are a sweet version that would be great for the holidays. These are the best low carb biscuits! I have made them with sour cream and even left out the sweetener and they still come out so yummy with melted butter and even biscuits and gravy. Thank you so much for this recipe! Glad you liked them, Beulah! I'm going to try them with coconut yogurt and subbing cashew four for the almond flour. I had to get a store to order the coconut yogurt for me as none of them stock the sugar-free one, but I think it will work. I'm temporarily (I hope) off all dairy while trying to diagnose an allergic reaction. That sounds like a great combination Judy can't wait to hear how they turned out. I'm still waiting for the coconut yogurt so I can try them with it, Beulah. I did hear of a store that sells it, but it is a long drive. Hi Emma. The low-fat yogurt might work fine in the recipe, I just prefer full-fat dairy for health reasons. I often use sour cream for yogurt and vice versa, so that would probably work too. Will look forward to hearing how your biscuits turn out! So I made these, used the convection setting on my oven and they puffed up like little mushrooms!! Fantastic flavor. However, I could never have gotten 10-12 regular sized biscuits from the amount of dough it made – it was very thick, like bread dough, so I added a touch of cream and about 1/4 cup of sour cream after the cup of yogurt. Even so, I was only able to make 12 slightly larger than golf ball sized dough balls at an inch thick each. I was afraid to flatten them much. Hi Emma. Mine were not very large biscuits either, as you can see in the picture above if you compare them to the size of the butter knife. (There were 12 on the pan, but I ate one!) I don't think I would change the recipe since they might not bake properly, but you could double the recipe and use two per serving instead of one. I see, mine ended up about 2" round each.. like a cream puff. Cute but tiny! I do love them though and the recipe was so easy. I added a squirt of fresh lemon juice and used a bit of sweetener to add to the "buttermilk" flavor. I cut open and toasted one in the toaster oven today and it tasted so familiar – I realized why: they tasted like life cereal to me! It must be the combo of the bake mix and yogurt, plus I used excess oat flour instead of the precious bake mix to dust the parchment with when rolling my biscuits. Thank you so much for the delcious recipe, and Thanks to Jen for concocting a perfect bake mix! Emma, I think mine were a bit bigger than that. Was your baking powder fresh? Thanks for letting me know how much you enjoy them! Nearly expired, however they did rise, they just didn't spread. All the rise was vertical. I had to shape them small to make 10-12 from the dough amount. Emma, you might try using fresh baking powder next time and see if it helps. Is Bob's Red Mill Organic coconut flour the same as the sifted coconut flour listed in the recipe? I have done some research and it appears oat bran absorbs more liquid. One person suggested just adding more liquid or adding an egg when substituting oat bran into a recipe. Thoughts? Dee, did you have a problem with too much moisture in your biscuits? Did you use Greek yogurt? It is thicker than regular yogurt. Using part oat FIBER to replace some of the oat flour might cut down on the carbs a bit, but oat BRAN is not as low in carbs as the fiber. I'm not sure how either would affect the recipe, but let us know how it works if you try it. These look amazing! I have oat bran but not oat flour. Is that likely to work? I only have Bob's Red Mill L/C bake mix on hand….Do you think I would be able to come up with good results using this? anjigirl, Bob's Red Mill's gluten-free flour would probably work fine in the recipe, but I don't think his LC flour is gluten-free and it might give different results. The Bob's gluten-free flour is not as high in carbs as many other versions, but still higher than Jenn's mix. If you try it, let us know how they turn out! Would love to try this, but my problem is coconut flour, is there any substitute for that? BJ, you can try another flour–it would probably work since there is just a little coconut flour in the recipe. I bought some hemp flour to try, but haven't used it yet. Garbanzo flour might work too. Why do you object to the coconut? Chareen, the bake mix ingredients are given in the recipe above the links. One of the links wasn't working, but it is fixed now. The other links go to other versions of her bake mix. Thanks for the heads up. Sounds great. Making 12 servings is the only way to get 6 net carbs from it though. If you make 10, it comes to 8 net carbs for each. You could always try Soy Flour. Michele, soy flour works well as a flour replacement, but many of us try to avoid soy because it contains a lot of plant estrogens (but not as much as flax). It can also cause thyroid problems and is usually GMO. There's not much coconut flour in this recipe, though, so a little might not be a problem. It is lower in carbs than most flour replacements. Stevia can be bought in liquid, such as Skinny Girl brand, packets, or in an actual sugar substitute. Cup for cup. You can even purchase in An organic brown sugar, etc. Walmarts carry these. Dont go for Sucralose, or sweeteners that contain aspartame. They are so incredibly harmful to your body. I've cooked and baked with lots of this stuff, and it's not only Amazing, but its also All Natural because Stevia comes directly from a plant! kbrede_rn. Any sweetener should work, but I tested the recipe with a liquid one so that's what I called for. The liquids are zero carb, while the others may vary. Stevia is not an option for some of us because it does not taste sweet to us at all. It's a genetic thing. (Julia Child also detested stevia.) There are lots of sweeteners to choose from though, and many of them are natural, such as monk fruit. Almond Flour can be bought online thru Vitacost.com AMAZINGLY cheaper than in the stores around us too! I think I got in on a Bob Mills sale last time and got 3 of their bags for what 1 cost here! Keri Knudson-Brede: You can also find almond flour at Costco in my area. Honeyville Grain also has good price on it. These are nothing short of incredible, thanks so much for this recipe! I used Cabot Greek Yogurt as it was the only full-fat greek yogurt I could find. My first batch was with Bob's Red Mill Almond Flour, the last two were with Honeyville. All three came out just fine, though the Honeyville was more spot-on with the texture. I made my own oat flour by running either oats or oat bran through my coffee grinder as I don't use oat flour that often. My biscuits in all three batches expanded and rose a little. I probably shaped them to be about 1/2" tall and around 2.5" in diameter, and they expanded to around 3" in diameter and maybe 3/4" tall. In the third batch I experimented a little with the "Cheddar Bay Biscuit" idea and added 1/2 cup of shredded sharp cheddar cheese, 2 teaspoons of garlic powder, 1/2 teaspoon of onion powder, and 1/2 teaspoon of old bay seasoning, all just before adding the yogurt. I would have put some parsley in them but I'm out of it, however they were very delicious and almost dangerous to have around the house! R. Franklin: Thanks for sharing all your ideas. The cheddar version sounds wonderful! I'll have to try that! Ms. Judy, my friend requires gluten free AND no dairy. Can you suggest a substitute for the yogurt? I would love to give her a recipe that will help her cope; she's newly diagnosed. Anonymous: Your friend may be able to find coconut yogurt. There are also recipes online for making coconut yogurt, and I think that should work. It might even work with plain coconut cream with a little vinegar added for tang, but I haven't tried it. Thanks for the comment! Does anyone know if you can freeze them? ualred: I never tried to freeze them; they never last that long around here! I don't see why it wouldn't work. Anyone else tried it? You are welcome, chisty0091. Glad you like it!